From May 2018 he is Chairman of Telecom Italia. currently sole Director of FAS Partners S.r.l., a financial strategic investor and advisor. He was Founder and Chairman of Innova Italy 1 SpA until its merger on October 1, 2018 with Fine Foods & Pharmaceuticals N.T.M. S.p.A. of which he is now a board director. 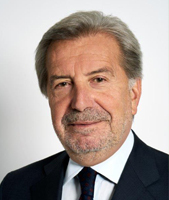 He is also promoter and board director of the Fondo Efficienza Energetica SGR S.p.A., and serves as Chairman of SGI S.p.A. (Società Gasdotti Italiani). and Real Assets), Europe Ltd. He was Chief Executive Officer and General Manager of Enel from 2005 to 2014.
power utility. He also finalized the formation and further listing of Enel Green Power. He held the position of President of Eurelectric in the years 2011 – 2013.
international companies in Belgium, United Kingdom and USA. Campbell in London and Brussels. actively participated to the plan of restructuring Ferruzzi Group. In 1997 he was appointed Vice-President of Eurofima. In 1998 he joined Telecom Italia S.p.A. as General Manager and Group Chief Financial Officer . USA, Unidad Editorial Spain, RBC PJSC Russia. Finance at the LUISS University MBA, School of Economics in Rome. Légion d’Honneur” of the French Republic.